Multi Commodity Exchange of India Ltd (MCX), India’s No. 1 commodity exchange was named ‘Best Exchange of the year in Bullion Industry’ at the 9th International Gold Summit & Excellence Awards jointly organized by ASSOCHAM, and World Gold Council at Shangri-La's Eros Hotel, in New Delhi on September 29, 2016. This award demonstrates MCX’s tireless efforts towards serving the bullion stake holders in their pursuit of effective price risk management and efficient price discovery. 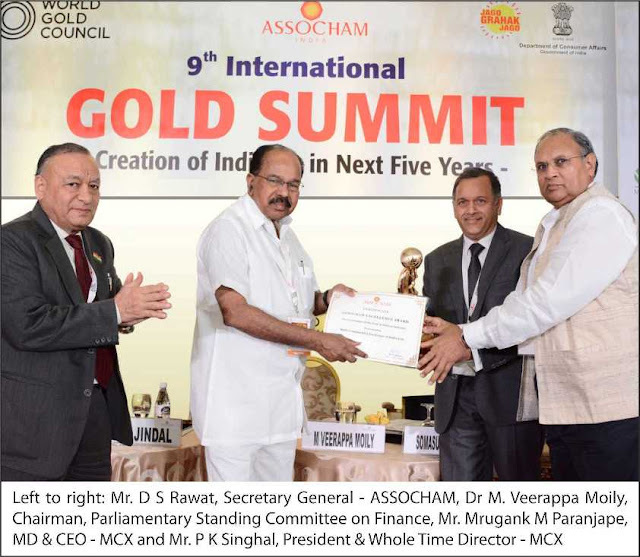 The award was presented to Mr. Mrugank M Paranjape, MD & CEO, MCX; and Mr. P K Singhal, President & Whole Time Director, MCX, by the Chairman, Parliamentary Standing Committee on Finance, Dr M. Veerappa Moily. The award is the latest recognition of MCX, which has won three ‘Best Commodity Exchange’ awards in the last two years at various reputable forums including India International Bullion Summit organized by IBJA, 14th Commodity Futures Market Summit & Excellence Awards organized by ASSOCHAM; and Bullion Federation Global Convention organized by Bullion Federation. Mr. D S Rawat, Secretary General, ASSOCHAM congratulated MCX on receiving this well-earned honour. He said “MCX provides a platform for efficient price discovery for gold in India”.